On May 8th 1865 seven tribes united: Bau, Rewa, Mathuata, Naduri, Thakaundrovy, Bua and Lakemba, naming themselves the United Tribes of Fiji. According to the Fijian historian R.A. Derrick they used a dark blue flag with central white five-pointed star. This information is built on contributions from Jaume Ollé and Mark Sensen, 2-3 June 1997 quoting an article in Vexilla Nostra no.164 written by Rene van den Maagdenburg. In a Fiji Sun article in 2015: http://fijisun.com.fj/2015/02/24/focus-fijis-flag-parade/, the author describes the flag adopted by the Confederacy of Independent Kingdoms of Fiji in 1865 as a "white star of eight points on a dark blue ground" (using the Sydney Mail of 12 August 1865 as a source). The presidency was on a rotating basis, and in 1867 the chief of Lakemba would become president. This was Ma'aufu, a Tongan who remained loyal to the Tonga king. The other chiefs protested, and Cakobau together with the other chiefs of the island Viti-Levu [Great Fiji] founded a new alliance with the name: Kingdom of Bau. Cakobau was proclaimed king of Bau 2nd May 1867. 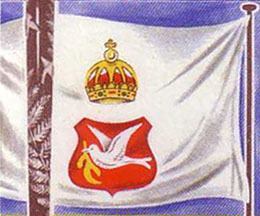 The flag according to R.A. Derrick was blue with half sun in the bottom (30 rays) and the royal crown in the upper hoist (the crown image in Vexilla Nostra is very unclear). Ma'aufu was still governor of Lau and Vanua-Levu (as vassal of the King of Tonga), which was known as the Alliance of North and East Fiji and used no flag. In the Fiji Sun article (http://fijisun.com.fj/2015/02/24/focus-fijis-flag-parade/), referring to Sydney Morning Herald of 30 July 1867, the flag adopted by the Kingdom of Bau in 1867 is described as being a tricolour of "white, blue, and red, placed horizontally, with the sun rising out of the blue ground, and a crown in the top corner", which contrasts with the sun and crown on a wholly blue field version shown above. The Fiji Sun article also mentions a separate personal flag for the King, though without descriptions. When the King of Tonga didn't support Ma'aufu any longer, the Kingdom of Lau was established 15th February 1869. The flag was horizontal white over red, with in the upper hoist corner a red cross. The personal flag of the king was vertical with in the upper hoist corner a white cross. On 5th June 1871 Cakobau proclaimed the United Kingdom of Fiji, joined by Ma'afu six weeks later. This kingdom used the white and blue flag until 10th October 1874 when the British took over government. The arms are derived from the Missionary Society. (Vexilla Nostra shows the arms alone on a white background but that's no flag). The flag shown by Jaume Ollé for the United Kingdom of Fiji that is different to that shown in the 1974 Fijian flag issue stamp commemorating the centenary of the deed of cession. Here is a scan of the relevant part of the stamp I refer to. In the Fiji Sun article (http://fijisun.com.fj/2015/02/24/focus-fijis-flag-parade/) the author notes that the flag adopted by the Kingdom of Fiji in 1871 (white and blue with a dove on a red shield) "didn't last very long", and that the "Executive Council of the King made a resolution to replace them by a red flag divided in into four equal cantons by a blue cross with a white border and a crown in the centre", and with the Merchant flag being "the same, but without the Crown". Though unlike the previous two flags I've mentioned, the author gives no sources for this one. I was wondering if anyone has seen the flag used by supporters of the July 2000 coup d'etat leader, George Speight. I briefly saw the flag on television  it looks like a brown and orange carpet  but have not been able to locate anything else. I can't help but wonder whether this was a traditional-styled Fijian tapa cloth. It would make sense as an emblem to represent native Fijians (the coup was an attempt to reduce or remove the influence of the Indian population - which makes up 45% of the population - from the Island's government). Tapa is still made in many south Pacific nations but it is often regarded in the islands as specifically Fijian. I also saw the flag lowering on television news. It was also reported by Christopher Dore, The Weekend Australian, 15th July 2000, p. 1, described as a Vanua flag and represented indigenous paramountcy. You will recall it looked like a light brown quilt with various indigenous motifs. There is a picture of the raising of this flag in the Sydney Daily Telegraph where it was incorrectly captioned as Speight supporters raising Fiji national flag. Unfortunately I saw the paper in a coffee shop and was unable to get a copy of the paper. I am unsure of the date but think it was the week of 3rd July 2000. During the last Fijian elections (counting has started today), the leaders of the 2000 coup d'etat were allowed to candidate. In the BBC World website you can see symbols of the National Alliance (Ilikini Naitini) lead by the failed coup leader George Speight: the party symbol is a blue hexagram, apparently identical to the Magen David. During coup d'etat was used a green flag charged with some kind, but I don't know if was the hexagram.